Turn to Ash, Vol. 3 is now up for Pre-order at the Turn to Ash Store. Orders will ship around the first week of September, shortly after the hangover from NecronomiCon has faded. Be sure to order soon as I’ve only got the rights for Matt Tisdale’s glorious cover for a limited amount of time. There will be at least 100, but probably not many more. Once those rights expire, the issue will either go out of print or we’ll release a second edition with a different cover, depending on demand and the number of copies sold. Speaking of, my intention has always been to limit the physical runs of each zine to 300 retail copies, and Vol. 1 has almost reached that terminal landmark, so make sure to pick up a copy if you haven’t already or it’ll be gone for good. Vol. 2 is still available and you should all be ashamed of yourselves for that. I kid, but more folks need to pick this up. Weird tales, written as call-ins to a Coast to Coast-style radio show, woven together by Jonathan Raab’s frenetic Gonzo-pulp-conspiracy-horror frame story. As Art Bell might suggest via some bumper music – take a chance – you won’t be disappointed. 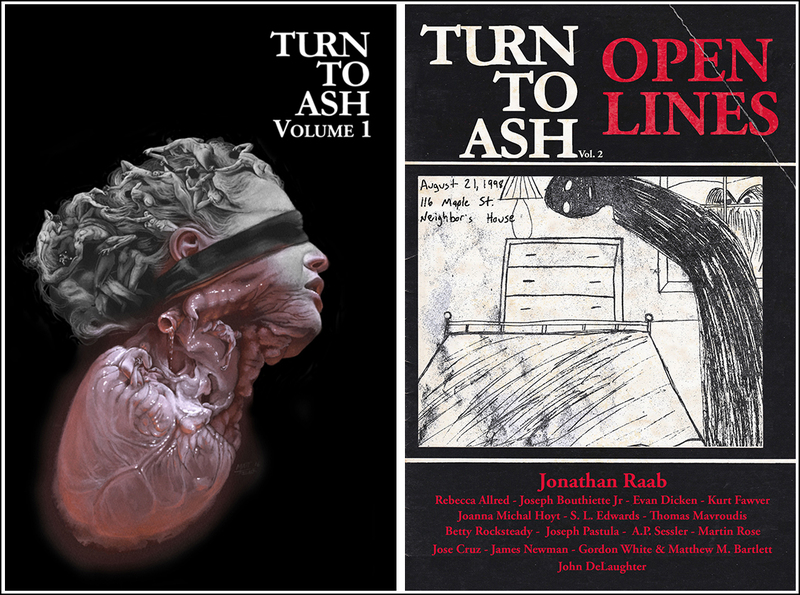 If you’ve been sleeping on the whole damn Turn to Ash thing, you can also pick up all three volumes at a discounted price via the Turn to Ash store. The contents of Vol. 3 are listed below the cover image. Let’s move some units, as they say in some biz or another, I’m sure. Vol. 3 is coming up soon, my best lady is graduating from college this week, and Spring will soon fade into Summer. None of this, save the turn of the seasons, comes for free, of course, so why not have a ludicrous sale to put some ink on paper and maybe buy my dearest a congratulatory malted? For the next few days, all purchases from the Turn to Ash store are 50% off. That’s $5 a book. If you’re in the US, that price will meet or beat Amazon’s. However, we will not be able to beat Amazon’s shipping speed because we obey the laws of thermodynamics in this house. If you are not in the US, well, congratulations, but Amazon is still by far the cheapest way to ship to you. Also, if you aren’t in the US, would you consider adopting me? Things are weird here. I’m almost 36, but surely we can work something out. Anyway, click the link below and spread the word. Cheers. Shooting for a July release. Cheers, weirdos. Cover by the unsinkable Matt Tisdale. I’m still going through submissions, and man, it’s gonna be tough. I’m probably going to wind up accepting twice as many stories as I had planned on, and still have to reject some that I really like. So, unfortunately, it’s going to take me another week to sort through the remaining submissions and make those tough decisions. Check back with me if you haven’t heard from me by March 22nd. The Turn to Ash, Vol. 3 submission window is now closed. Thanks to all who subbed. I will do my best to respond to all submissions by the 14th of March. If it looks like I’m not going to make that deadline, I’ll post an update here with a new estimate. There were 246 submissions this time, which is a lot, but not quite the deluge I got with Vol. 1. I am thankful for that. I hope to have a cover reveal and a TOC in a little over a month. Past that, stay tuned to this spot for some exciting news about free monthly fiction and a subscription service for a bi-annual limited edition print collection of those stories and more. A bit further out, look for news regarding a SUPER SECRET™ novella that’s in the works and a slightly-less SUPER SECRET™ anthology project, both currently planned for release in 2018. $3 from all orders will go to the ACLU until further notice. Hey, there. Until it no longer seems necessary, I’ll be contributing a portion of each sale from turntoash.storenvy.com to the ACLU. $3 for each order. After I announced that I realized that the minimum donation is $5, so I’ll donate $6 for every two orders. If it’s been a couple of days and I’m stuck on an odd number of orders, I’ll round up to $5 on one. Please tell me in the order notes under what name you would like your portion of the donation made. I’ll send you an email receipt when the deed is done. Well, it’s that time of year. That’s right; it’s time for us to pay the annual hosting fee for our website. What a great and totally unrelated time for a sale in the Turn to Ash store! Now through Friday night, you can get both volumes of Turn to Ash for only $14 plus shipping. That’s less than $20 total. That’s 25 stories, 5 non-fiction columns, 2 interviews, and more than a handful of artwork for precious little dough. If you’ve got one issue and need the other, they are also available individually for $7 plus shipping. Click HERE or on the picture above to be magically transported to the store.